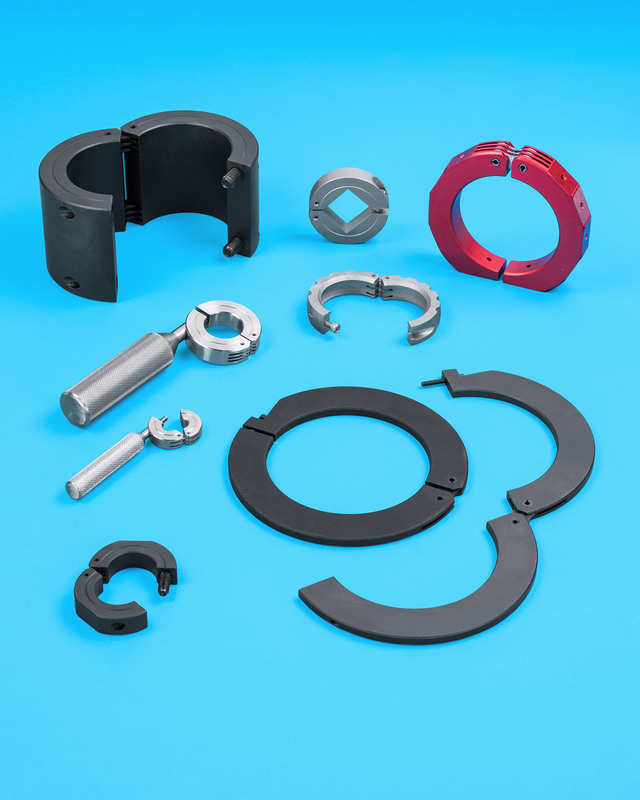 Custom hinged shaft collars that can be manufactured in many configurations including with mounting holes, quick adjustment handles, and other special features are available from Stafford Manufacturing Corp. of Wilmington, MA. Stafford Custom Hinged Shaft Collars feature a high-strength hinge and a captive clamping screw to eliminate parts, fumbling, and lost screws but provide the same holding power as standard two-piece split shaft collars. Manufactured to user requirements, they combine adjustability, safety, and functionality with features such as the Grip & Go™ quick-release handle for rapid linear positioning, mounting holes for sensors, and different bores. Ideally suited for applications requiring quick-adjustment in remote loca-tions, Stafford Custom Hinged Shaft Collars can be manufactured from steel, stainless steel, aluminum, brass, bronze and 1018 steel for welding attach-ments. Available in sizes from 1/8” to 8” I.D. they can incorporate round, square, hex, and threaded bores along with flats and other O.D. treatments. Stafford Custom Hinged Shaft Collars are priced according to configuration and quantity; with two week typical delivery. Price quotations are provided upon request.